PALM BEACH, Fla. — The White House said Saturday that an individual was apprehended after jumping a low metal barrier just outside the White House fence, a week after an intrusion raised questions about lapses in security under the watch of the U.S. Secret Service. White House press secretary Sean Spicer wrote on Twitter that the individual “jumped bike rack on Pennsylvania Ave” but did not make it onto White House property. President Donald Trump was not at the White House on Saturday. He and his family are spending the weekend at his Palm Beach, Florida, resort. The Secret Service did not immediately reply to a request for comment. The incident comes about a week after a man breached a 5-foot outer perimeter fence and scaled an 8-foot vehicle gate to gain entry to the White House grounds. Video surveillance footage shows Jonathan Tuan Tran, 26, of Milpitas, California, climbing the fence near the Treasury Department adjacent to the White House security fence and making his way to a south entrance, the criminal complaint said. Tran, who the Secret Service said was carrying two cans of Mace, is charged with entering restricted grounds while carrying a dangerous weapon and faces up to 10 years in prison. 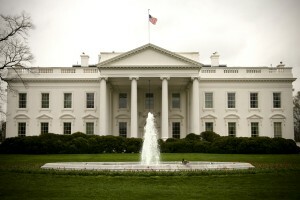 The Secret Service stressed that the intruder never made it inside White House. The agency said it was still investigating and had put additional security posts, technology enhancements and new response protocols into place. Similar lapses occurred during the eight years that Barack Obama was president. In September 2014, an Army veteran with mental health issues scaled a fence on the Pennsylvania Avenue side of the White House and made it deep inside the building, to the East Room, before the Secret Service could detain him. The Obamas were not at home at the time. The incident was one of several breakdowns by the Secret Service that ultimately led to the resignation of the agency’s director, Julia Pierson, the following month. Trump has to find someone new to lead the agency. Joseph Clancy, a former agent who came out of retirement to succeed Pierson, announced his second retirement last month.